So this happened last night. Book finished, and 100k reached, both at the same time. Let me tell you, that was hard. Rob helped by pestering me on Twitter while he was away at Emerald City Comic Con. As his reward, he gets to be one of the first to read the giant mess of a manuscript that I have here. Thanks, Rob! All I have left to do is clean up some of the continuity issues, which are very tiny things. 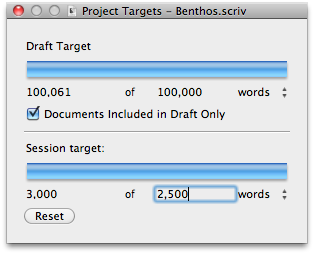 Then it goes out to the readers and I can look forward to DRAFT TWO.